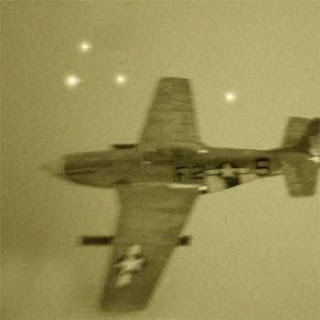 This photo shows (possibly) German "foo fighters" chasing an American bomber across the European Theater in WWII. Foo fighters may have been among the first unmanned drones used in war. It is possible they used VRIL technology, and may have been an extension of the Haunebu Program. Foo fighters -- also known as bogies -- were reportedly unarmed, and apparently used for surveillance.